Budapest is a magical, budget-friendly, and exciting with a little something for everyone in Central Europe! 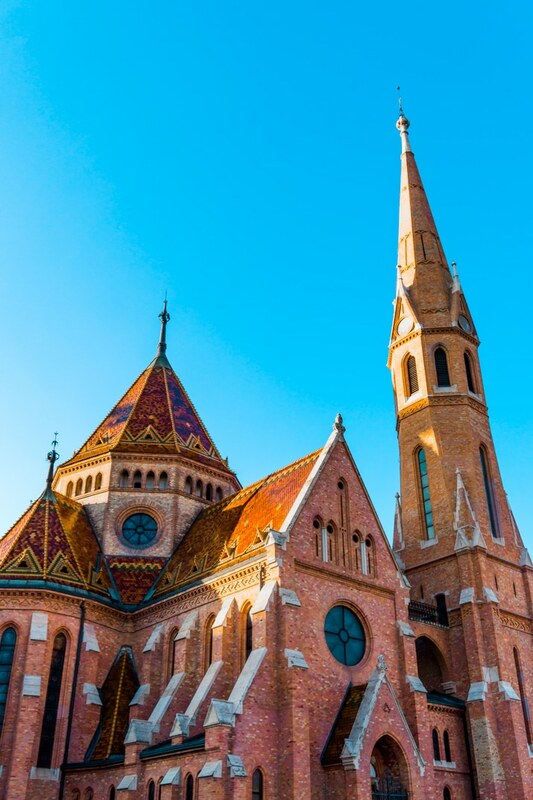 Soak in the mineral baths, grab a bowl of goulash, and float along the Danube River to take in everything this amazing city in Hungary has to offer! 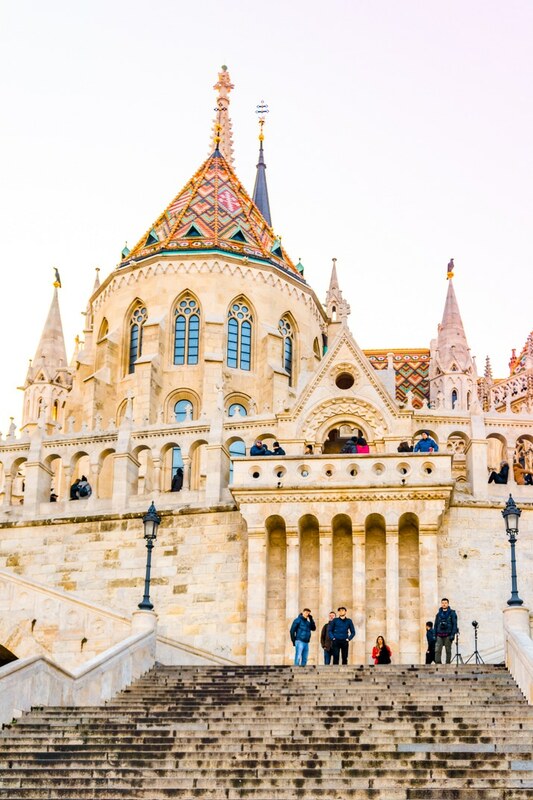 Budapest, Hungary is a paradise for budget travelers, history buffs, and foodies! 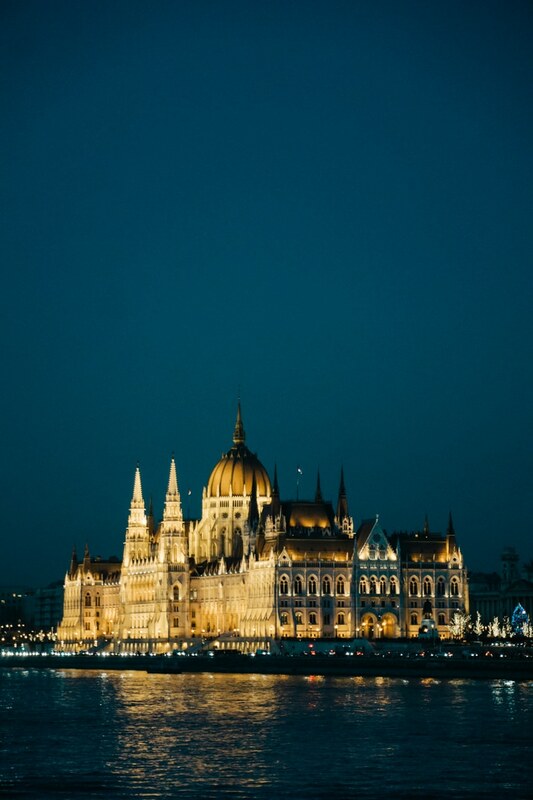 These captivating cities (yes, Budapest is actually two cities – Buda and Pest) are full of ornate architecture, luxurious and healing bathhouses, and amazing coffee houses. All these things and more make Budapest a top destination in Europe! During my recent road trip around Europe, Budapest was our first major stop and the one I was most looking forward to. And I’m excited to have partnered with Mediavine, a leading ad network for food, travel, and lifestyle sites around the globe to bring along a videographer on our trip to capture all the magic of this beautiful city, check out a teaser of our time there in the video below! I did a lot of research on what to do in Budapest before our trip, I didn’t want to miss a thing, but time does have its limits. I will say that just a couple of days in Budapest is nowhere near enough, I feel like we did a lot with the time we had, but when I think about all of the things there is to do in Budapest, I feel like I barely scratched the surface of the city and I can’t wait to go back someday. When I do go back, I would love for it to be in the summer or early fall, because Budapest gets cold. Which was only compounded by the fact that on our second day there, the heat stopped working in our Airbnb and our host didn’t fix it before we left, this meant two freezing cold nights there since the temperature was barely above 5° F while we were there. Travel is never without its issues, but this one was definitely a bit rough at the time. 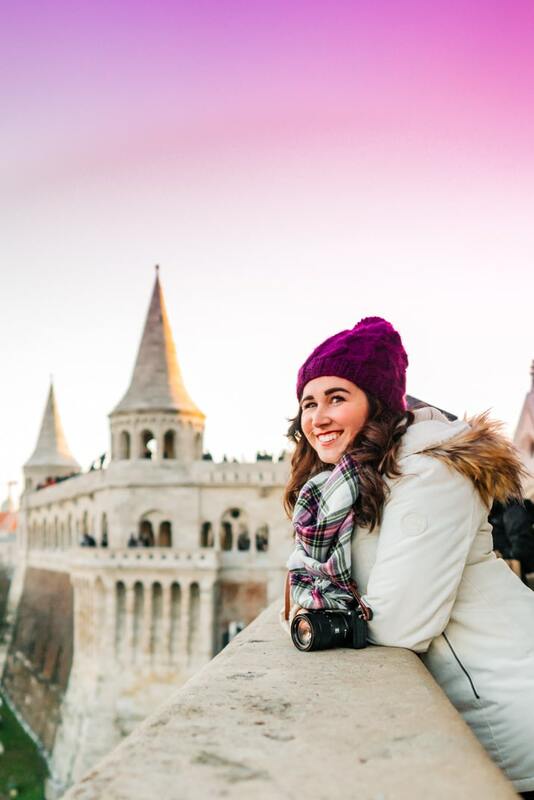 But thankfully, Budapest is such an amazing city that even the cold didn’t dampen our visit too badly and we had a great time exploring the highlights and indulging in all of the wonderful food! So let’s take a look at how to spend 48 hours in Budapest, Hungary! Breakfast at Szimply – I loved this little cafe and they serve breakfast ALL DAY! It had all of like six tables in it, but it was cute and the food was delicious even if a bit eccentric. Hidden in a small courtyard off the main road, try their pancakes and fresh pressed juices. Coffee at Kontakt – This specialty coffee shop is right across the way from Szimply is a real treat and they only do “real” coffee – no cream, sugar, nothing. Just coffee. You can grab a cup to enjoy with breakfast at Szimply or you can get it afterward, but it is pretty great! Swing by St. Stephen’s Basilica – It’s worth it to stop by and check out the neoclassical architecture of this basilica, if you have time, pop inside to check out the beautiful artistry that went into the interior. Pit Stop at Espresso Embassy – Yeah, I know, you just had coffee, but Budapest is known for their bold roasts and there’s so much to see and do so you need to make sure you’re thoroughly caffeinated! Check Out Parliment – This is the world’s third-largest Parliment building, and it’s absolutely beautiful. It sits on the banks of the Danube River and when the National Assembly isn’t in session, you can book a guided tour of parts of the building. The tours last about 45 minutes and cost around $16.00 for non-EU residents. 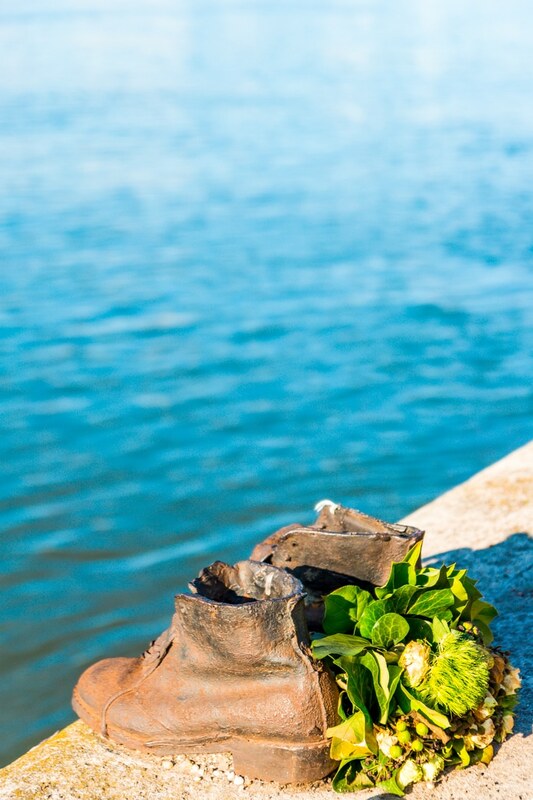 Shoes On The Danube – Regardless of whether or not you’re a history buff, this is, in my opinion, the most important thing to see in Budapest. During WWII, approximately 20,000 Jews were brutally shot along the banks of the Danube River by the Arrow Cross Party. The victims were forced to remove their shoes at gunpoint (shoes being a valuable commodity during World War II) and face their executioner before they were shot without mercy, falling over the edge to be washed away by the freezing waters. It’s hard to stand at the memorial, next to their shoes, and hold it together. So don’t. Let those emotions out, because we must never forget the terrible crimes committed against humanity. 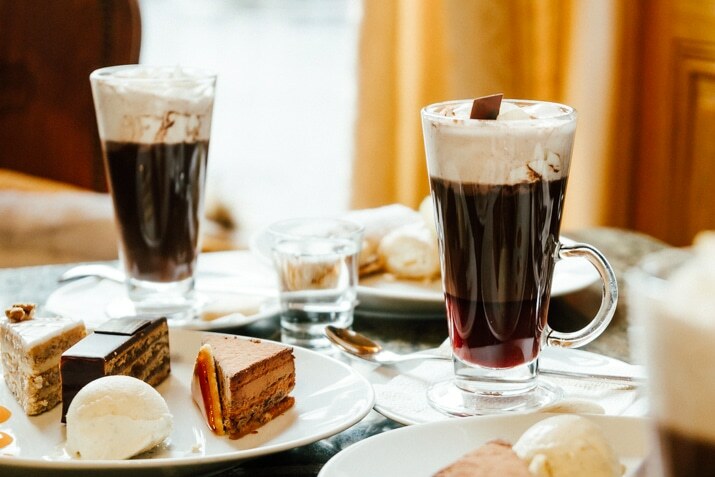 Lunch at Café Gerbeaud – Okay, so, not sure if you can call pastries lunch, they have other options too, but it’s the pastries you’re here for. This place is pretty touristy because it’s so famous, but it’s still worth a stop! Get a coffee or hot chocolate (not a lemonade) and indulge in a slice or two of one of their lovely pastry options! Peruse the Central Market Hall – One of Budapest’s biggest attractions might just be their indoor Grand Market Hall filled with food and souvenirs. It’s definitely worth a walkthrough! Warm Up in the Gellért Thermal Bath – I hope you packed your bathing suit because the baths are one of the best things to do in Budapest and we have two on the agenda. It’s a great way to soothe those muscles after a long cold day of walking around the city. The Gellért baths are indoors, are open until 8 pm, and cost around $25.00 per person. Dinner at Fat Mama Eatery – I loved this place! The food was great, the atmosphere was laid back, and the live music didn’t hurt either! They change the menu up frequently, so it’s different now, but we really enjoyed our evening here. Drinks at Szimpla Kert – Ruin Bars are huge in Budapest and this one is the most famous of them all! Ruin bars have been around for almost two decades, it all started when this place is nestled itself into the ruined and abandoned buildings in the Jewish District of Budapest. These bars are eclectic and some even move around when the abandoned buildings their in get purchased by investors. It’s kind of a fun idea, a pop-up bar, and it’s where you’ll have the more fun in Budapest. But please remember to always be cautious when traveling and bring a buddy. Start at My Little Melbourne Cafe – Before you get going with your day, grab some coffee and a small bite at this place and then grab a taxi or public transportation to the baths. 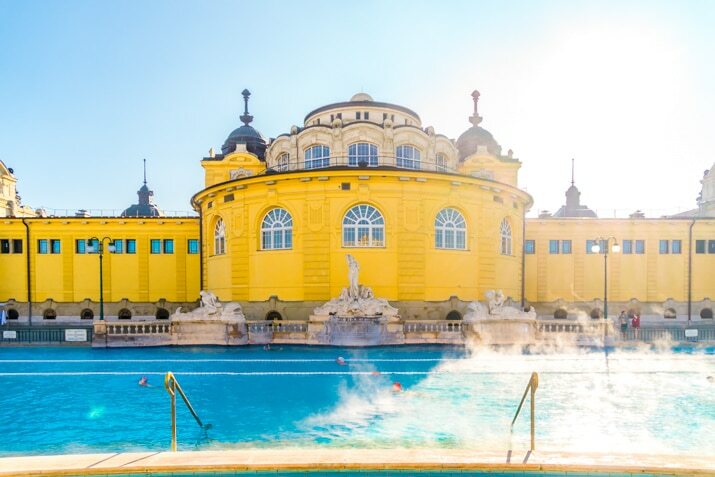 Soak in the Széchenyi Thermal Baths – Even if you visited the Gellért baths the day before, these baths are a completely different experience, especially since some of them are outside! The fast track opens at 9 am, but the pools actually open at 6 am, you just have to buy your tickets at the counter if you go really early. Biggest tip here: Splurge on the changing cabin and bring flip flops! Stroll the City Park – The baths are actually located in the park, so stroll through on your way back into the city center. Take in Heroes’ Square – One of the major squares in Budapest, Hungary, noted for its iconic statue complex featuring the Seven Chieftains of the Magyars and other important Hungarian national leaders, as well as the Tomb of the Unknown Soldier. We were lucky enough to be passing by during the wreath laying at the Tomb. Grab a Bite at Solinfo Cafe – After a busy morning, you’ll be hungry, this place is actually a lamp shop with a cafe and they serve up some pretty delicious food! I highly recommend the pancakes and hot chocolate, the omelet was pretty fantastic too! Visit the Dohány Street Synagogue – Just adjacent to the cafe, you’ll see the Synagogue, it’s pretty hard to miss considering it’s the largest in Europe and the second largest in the world. It also houses the Hungarian Jewish Museum. Make to cover your knees and shoulders if you plan on going inside. 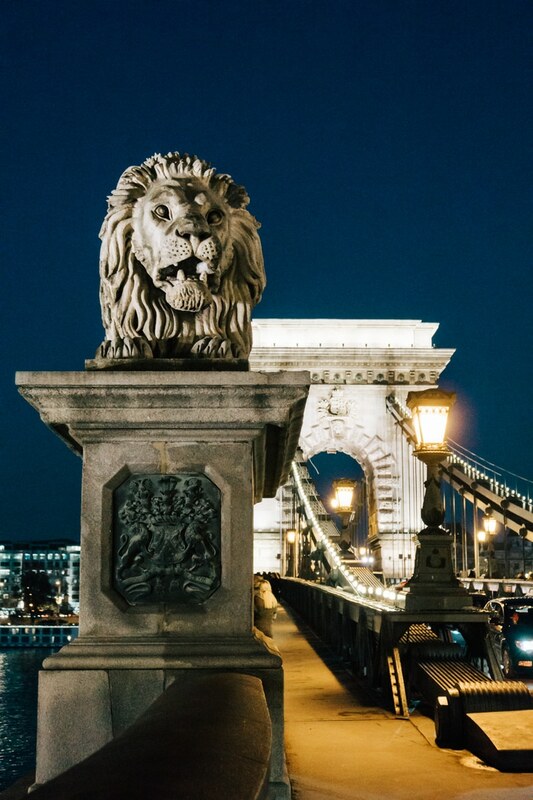 Cross the Széchenyi Chain Bridge – This famous bridge spans across the Danube and allows you to take in great views of the two cities. Since it’s establishment, it has become a symbol of advancement, national awakening, and the linkage between East and West. Explore Buda Castle – We didn’t get a chance to do this, but I wish we had, take the Castle Hill Funicular from the end of the bridge to the top of the hill and explore the castle during the afternoon. Sunset at Fisherman’s Bastion – This was one of my favorite stops in Budapest, even more than the baths. I love the views we had of the city and the Bastion itself is quite impressive. I would recommend going for sunrise or sunset, there will likely be fewer people, you’ll likely need some change to pay to get up the lookout tower, but it’s so worth it! Finish at Fidel’s Cabaret – I really wanted to go here during our trip, but it just wasn’t in the cards, so make sure you book in advance and have an amazing time! I have heard nothing but good things about this place! When it comes to Budapest, there is no shortage of amazing restaurants. We couldn’t visit all the ones on our list, but here are a few others to check out if you’re in the city! So, in case you couldn’t tell, I really love Budapest, and I think that it’s attractiveness will only continue to grow in the coming years as flight costs from the US to Europe continue to drop. Budapest is what I would call a hipster city, it’s got a lot to offer and the day to day costs are pretty reasonable. An absolute must-visit in my book! 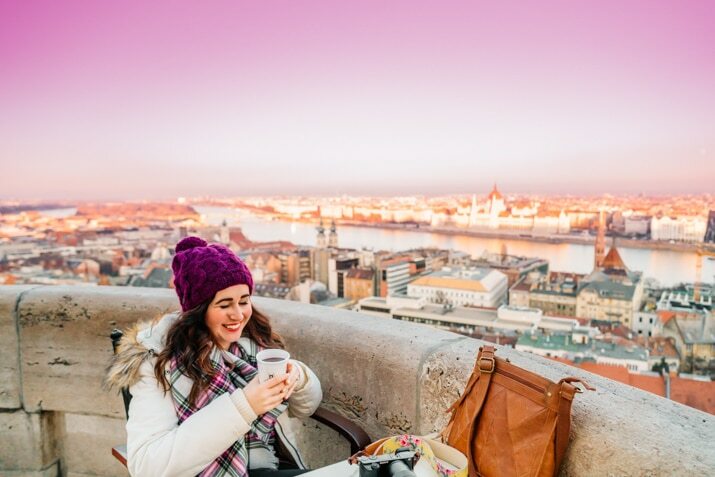 Get the Lonely Planet Budapest Guide for even more help planning your trip! Use My Budapest Map To Guide You! More Weekend Adventure You Might Enjoy! Pin this Budapest Travel Guide for Later! We know our next travel destination. Budapest is stunning! Thank you, I hope you get the chance to visit someday!